Here’s the truth: College is an investment.Yet, at the same time, a college education has never been a more important asset than it is today. According to industry analysis, in 2011, the average annual earnings of college graduates were 65 percent higher than the average for high school graduates. With a master’s degree, the average rises to nearly 100 percent higher – in other words, double the income. And, with a professional degree, earnings are 260 percent higher. So, college is an important investment and one that brings tremendous returns. But, why is college so expensive? And, why are the costs between schools so different? Here’s the reality: cost structures of educational institutions are driven by the fact that they are a people enterprise. Our “product” is education and only people – highly educated, passionate, driven, caring and curious people – can deliver it for us. At Augustana, we employ technology in our classrooms and our laboratories to deliver online and hybrid classes; in our residence halls; our library; and for administrative activities. But the best teaching happens when professors are engaged with students in a live (not virtual) setting. As an institution, our largest investment each year is in people, both in salaries for those who teach and in scholarships for good students who come here to learn. And frankly, I believe that’s how it should be. As a private college, we receive no state funding, which means it’s up to us to raise the money necessary to pay faculty salaries, cover operating expenses and fund capital improvements. Being a private college also means we make our own decisions. We’re intentional about keeping our class sizes small so we can create the best student-professor experiences for students. In addition, we’re focused on creating opportunities for undergraduate research, internships, community engagement, leadership and study abroad. Experiences outside of the classroom contribute greatly to successful job placement and admission to graduate school. The tuition we charge students covers some of our operating costs. The rest are paid for through our own fundraising efforts. It makes us very proud to say that, because of the great experiences they had here as students, thousands of Augustana alumni give gifts to the College each year. A large percentage of those gifts are designated for student scholarships – so our nation’s brightest and most innovative young people can benefit from the instruction and wisdom of our renowned professors and the insight and experiences of global leaders who visit campus for events such as the Boe Forum on Public Affairs. At Augustana, nearly 100 percent of our students receive scholarships and financial aid. The average financial aid award is $25,900. There is no question about it – an Augustana education is an investment. But, know this: an Augustana education will be one of the best investments you’ll ever make. After your four years here, you will be a highly knowledgeable individual with the critical thinking and communication skills necessary to succeed in the career of your choosing. Based on data from the graduating class of 2012, 98 percent of Augustana grads reported finding employment in their field of study within six months of graduation. In addition, 28 percent are enrolled in, or are planning to enroll in, graduate school. Of those, the vast majority are pursuing medical-related advanced degrees. Beyond securing a career you’re interested in and passionate about, as an Augustana graduate, you’ll also be empowered by a foundation built from studying the liberal arts, which means you’ll have the skills to navigate change, think creatively, and solve problems. You will also have an appreciation for art and music; an understanding of other cultures; a deeper faith; and knowledge of the global community.You will understand how to live a life of meaning and purpose. We believe that students who choose Augustana do so because they want more from their college experience than just a diploma. Students who decide to “Go Viking” want to explore and discover important ideas; they want to be part of a community that lives and learns together; and they want to do their part to create a better tomorrow. You are receiving this publication because we believe this to be true of you, as well. 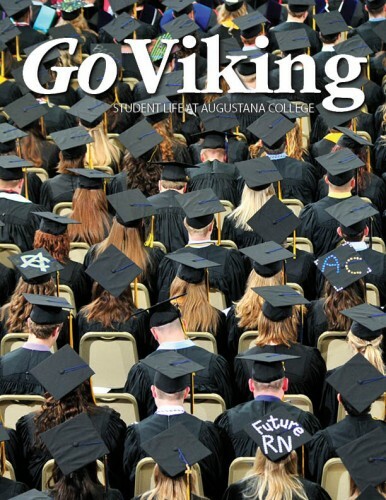 On behalf of Augustana, we’re looking forward to helping you achieve your educational and life goals. I hope to see you on campus soon!